This little owl lives in Eastern North America year round. It's an Eastern screech owl, grey phase. I painted the rest phase a few years ago amid autumn leaves, but the grey version has wing markings that are quite different. 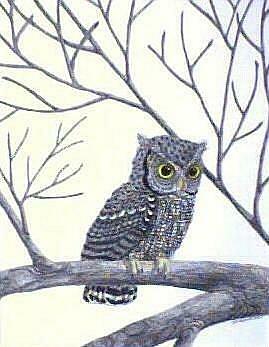 There is a Western screech owl, but it has a black beak & lives in a smaller western range.